FREE Quotes from Local Handymen! Quickly Build Anything from Beds and Wardrobes to Office Furniture! Use handyman services so you never again have t build another piece of flatpack furniture! If you are one of those people who hate counting all the numerous little screws, bolts and fixings, hate unwrapping flatpack boxes and trying to read the confusing instructions. Or if you are one of those people who have had to take furniture apart again because you built it incorrectly? Then using a local handyman makes a lot of sense! Their are handymen all over the UK with lots of experience in flatpack assembly from major retailers such as Ikea, B&Q, Habitat, John Lewis and Argos. Because they have done a wide range of furniture assembly, they can do it quicker and simply leave you to enjoy the finished product. Handyman services can build anything from beds, wardrobes and bunk-beds to office furniture. Many providers offer same day appointments when you call with fixed prices and no hidden extra charges or call out fees. If you have a busy schedule that prevents you from assembling your flatpack purchases then a local handyman can put it together quickly and efficiently on your behalf. They are also happy to help you with assembling furniture after a move, relieving some of that stress. There are plenty of horror stories about people getting ripped off by tradesman and contractors in the home, but these are less common than you might think. Nevertheless, you must do due diligence when finding the best person to hire for your job. Handymen are multi-skilled tradesmen who focus on everyday jobs around the house, they are perfect for simple repairs and maintenance, taking no more than a few hours. But be aware that certain jobs must always be carried out by a suitably qualified tradesman. Such as any gas work and many electrical jobs. For example electrical jobs must be approved by your Local Authority Building Control unless they've been carried out by a qualified electrician. So as long as you are sure you need a handyman and not a specialist, shop around a bit first, compare multiple quotes and make sure you're completely happy with the work before you part with your money. details about your job with contact information, then let local handymen get in touch with you to provide quotes. Do not be fooled by those who offer big discounts for paying cash upfront, or you may find yourself appearing on a Rogue tradesman TV program! If possible find a handyman who has already done some work for friends, family or colleagues, so you can get an honest review of their work. With flat pack assembly services provided by local handymen, you simply tell them what you need assembled and they will tell you exactly how much it will cost! Some companies have fixed rate prices for items of furniture, with a fee of around £36 to £60 depending on the item, for example, a small bed or bedside cabinet will cost around £36, whereas a large wardrobe with hinged doors will cost from £54 upwards, depending on the number of drawers or other accessories. 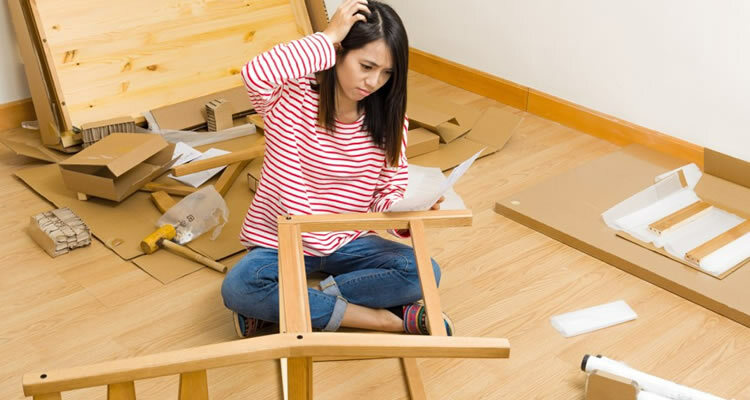 Some flat pack assembly services will charge by the hour, but this type of service is not recommended as your bill could spiral out of control if the installer gets into difficulty assembling an item, better to stick with handymen and specialist companies that offer a fixed price.